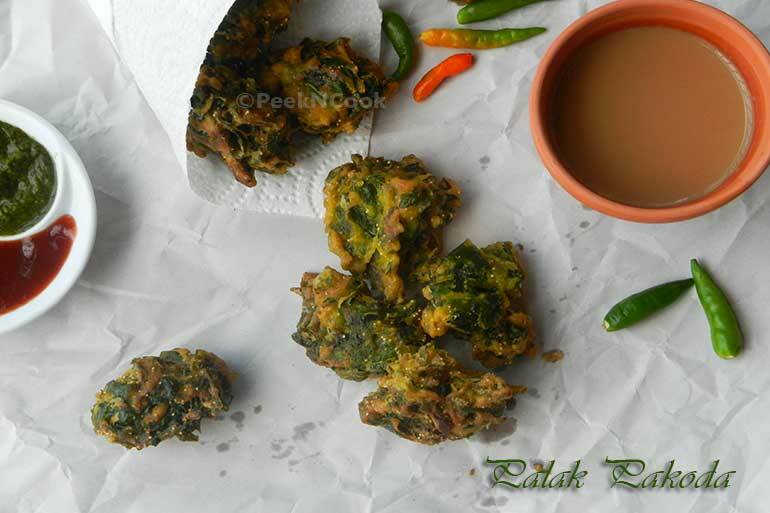 Palak Pakoda is very tasty and helthy snacks for your kids. As kids do not want to have palak or Spinach. But this They will love Chat Pata snacks. Palak Pakoda is the best option for the kids. Chopped Spinach and other spices dipped into Bengal Gram/Besan Batter and deep fried. Spinach is a very healthy edible flowering plant. Spinach has lots of nutrition value. It has anioxidents . Spinach is a good source of Vitamin A, vitamin C, vitamin E, vitamin K, magnesium, manganese, folate, betaine, iron, vitamin B2, calcium, potassium, vitamin B6, folic acid, copper, protein, phosphorus, zinc, niacin, selenium and omega-3 fatty acids. It has also a very good source of Iron, which kids need much for their growing. It is also a good calsium source. In one word Spinach is a good healthy Leafy Vegetable..
First take the chopped spinach in a Large pasta strainer and wash thoroughly to remove the dust. Now take all the ingredients in a large bowl except water and oil and mix them well. Add very little water at a time to mix it mixture into the bowl. Add little by little water until the mixture is not become like a thick batter mixture. Let the mixture rest for 30 minutes. Now heat oil in a deep wok and add a tablespoon full of the spinach mixture into the oil . Do not over crowd the wok. Add 4-5 tablespoons for 1 batch. Fry the Pakodas until they are golden brown. Turn them when one side is done. Take the fried Pakodas out of the wok and put onto Paper towel to absorb the excess oil of the pakodas.